Dunstanburgh castle is somewhere I have always wanted to visit. Every time we have paid Craster a visit I have looked at it in the distance and thought 'one day'. The thing is, the castle is fairly remote (a 1.6 mile walk along rugged coastline) and there are no toilet facilities on site. Because of this, I have not been brave enough to attempt the walk with a toddler or two. However this week it just so happened that we were in the area and child free so we decided to finally pay a visit. 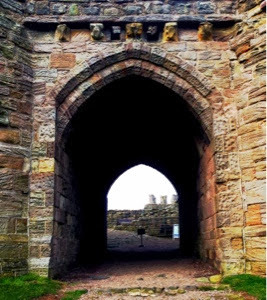 To visit the castle you need to park in the main car park at Craster (£2 all day). Make sure you visit the loo's in the car park as you won't get the chance again for a while! The walk from Craster to Dunstanburgh is very popular with walkers. 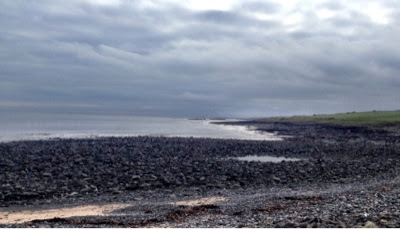 You walk on grass alongside a very rugged coast which makes the whole walk seem very dramatic. At one point you need to walk through a field of sheep, but don't worry, they are perfectly friendly. Make sure you keep dogs on a lead at this point though. Throughout the whole walk, Dunstanburgh castle is in view standing proud on this remote part of the coastline. Our walk in February was just after a period of very heavy rain. The route was muddy and slippy, involved climbing over a few small rocks and crossing a stream. Not a route recommended for the infirm as there are no seats or resting points en-route. You feel great when you reach the castle. Entrance fee in only £4.20 for adults and even less for children or free if you are National trust or English Heritage members. There is a small shop on-site selling gifts and more importantly cold bottles of water! The assistant was very friendly and advised us about various points of interest. He was so enthusiastic that we decided to buy a guide book to learn more which at £3.50 was a bargain. 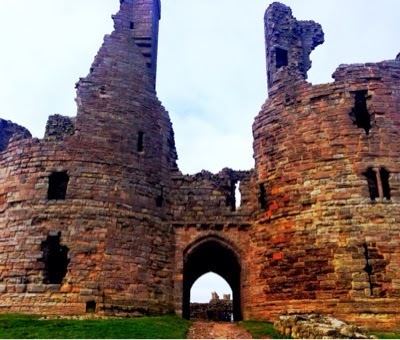 I enjoyed reading about the history of the castle especially how it was used in world war 2. 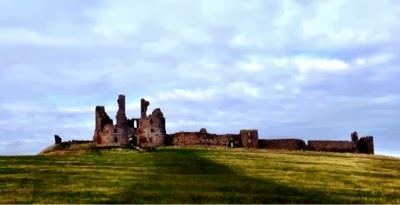 Dunstanburgh castle is a very rugged ruin of a castle. Don't visit expecting ornate rooms. Do however expect dramatic and inspiring views. I managed to take some wonderful shots from various points in the castle. 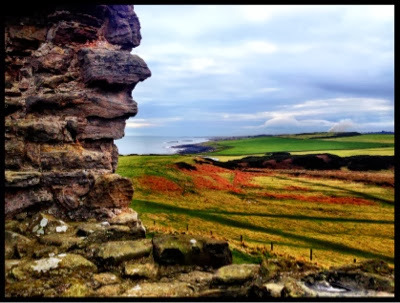 You can climb right to the top of the castle for spectacular views across the coastline in both directions. Be warned though that the steps are steep and I must admit to feeling a bit sick as I was climbing up. The views are certainly worth it though, so do climb to the top if you can. There are picnic spots within the castle ground and dogs on leads are allowed too which I think is marvellous. 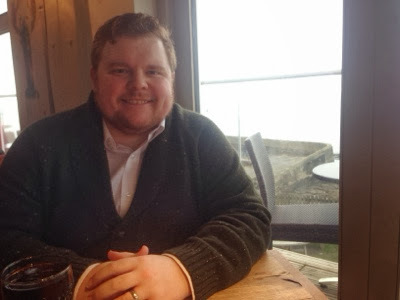 We spent about an hour in the castle, admiring the views, taking photographs and reading about it's history before heading back along the coast to Craster. I would recommend a visit with children aged 5+ as in my eyes, the site isn't particularly toddler friendly (no loo's, long walk and steep stairs - not the castle's fault might I add). Most people end up at The Jolly Fisherman pub after their walk. This is the only pub in the village and always bustling. 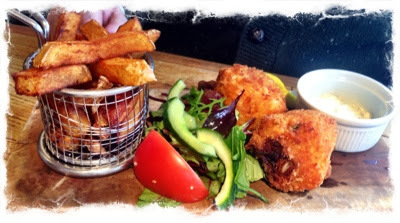 They serve real ales and boast spectacular views of the coast from both the dining room and the outdoor terrace. The food is pretty amazing too. 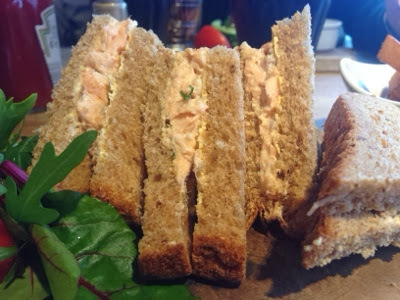 We enjoyed salmon sandwiches and homemade fishcakes just before lunch service finished at 3pm. The real star of the show though were the beef dripping chips which would be worth the journey to Craster alone. If you continue walking past the pub (in the direction away from the castle) you will come across a lovely little park which is perfect for the kiddies. Within the small village there is also an art gallery, coffee shop and the world famous Robson's smokehouse whose delicious smokey aroma you can smell throughout the village. Make sure you pop into the smokehouse shop for some signature kippers and the adjoining fish restaurant is also very good. Craster is a village that has it all. I absolutely love it and I'm pleased we have finally managed the walk to Dunstanborough castle and back.